We offer cold laser therapy to promote the fast healing of acute injuries and to help manage chronic inflammation. The cold laser is a safe treatment with many benefits. Treatment is convenient: you can use it at our location, or in your home. When the body is injured, cells are damaged and fail to function normally. Low-level waves from the cold laser machine penetrate deeply into the skin and restore normal cellular function. 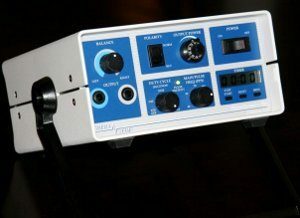 Cold laser uses a non-heat-producing light laser, locked at a wavelength optimal for treatment, to penetrate deep into tissues. Cold laser, also called low level laser therapy (LLLT), is emerging as an effective modality in the healing arts community. Cold laser has been shown to significantly accelerate and enhance the body’s natural defense and repair mechanisms. Physiological effects include improved metabolism, circulation and tissue healing. By reducing the duration of inflammation and enhancing specific repair and healing processes, cold laser has been proven to provide pain relief and reduce damage and loss of function from injuries. Nerve and Spinal Injuries: According to study at University of Health and Sciences, Bethesda, MD., cold laser can rehabilitate severed nerve bundles at a 300% faster rate than the control group’s rehabilitation (research conducted by Anders and Broke). The recovery observed in the study occurred after only 14 90-minutes treatments. These results suggest a promising future for cold laser treatment of peripheral nerve damage and spinal cord injuries. 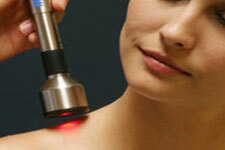 Cancer: Cold laser therapy may inhibit cancer cell growth while enhancing healthy cell growth. Research at the University of Munich shows that cold lasers have a bio-modulation effect, inhibiting the activity of overactive cells and stimulating underactive cells. Inflammatory conditions: carpal tunnel syndrome, epicondylitis, plantar fascitis, and bursitis. Neurological injuries such as prolapsed disc, herniated discs, crush injuries, neuritis, and headaches. “Light therapy” is not a new concept. The sun’s photonic rays cause a seed to sprout through RNA and DNA changes. The sun’s rays are full-spectrum light, which means many wavelengths are present (400-800 Nanometers), but only one specific wavelength, or frequency, causes the seeds to germinate. In 1924 Bose and Einstein, great men of science, predicted the Laser. Laser is an acronym for Light Amplification by Stimulated Emission of Radiation. The lasers we use at Bloomington Family Chiropractic is a low frequency laser, with a very specific 635 Nanometer wavelength. It uses coherent light, which is light traveling in the same direction at the same wavelength. The human cell functions at 630-640 nanometers (NM). It has been documented that DNA replication occurs at 635 NM, and cellular phagocytosis (cellular housecleaning or detoxification) happens at 634 NM, and that injured neurons (nerve cells) heal best at 635 NM. WHAT IS THERASTIM ELECTRO THERAPY? The Therastim (also called “ARPwave”) uses conductive electrode pads to provide neuromuscular stimulation. It treates the neurological origin of soft tissue conditions, not just the physical symptoms. The Therastim features a state-of-the-art electrical mechanism designated as a class 2 medical device by the FDA. Treatment includes unique Therastim protocols and testing techniques. Therastim has been proven to be an effective treatment for those who have been told they need surgery and for those who have already had surgery. Every year, thousands of patients receive Therastim treatment, it has proven effective on all types of chronic pain including RSDS and Fibromyalgia. Treatment Time: 10 – 20 minutes. Treatment Frequency: Variable based on condition. Often twice per week for 2-4 weeks for severe or chronic conditions. Some conditions may only be treated occasionally or as required. Learn about the different therapies we offer to help you feel better faster.